Founded in October 1996 by Susan Lee, Idearich is an integrated graphic and visual design firm in Taiwan. Idearich provides total image and visual solutions to our customers and has amassed a broad base of experience with a wide range of products over its 15 year history. LiiU is the new brand created by Susan Lee, and is the Chinese word for “gift”. 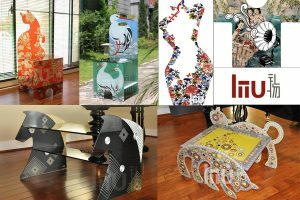 LiiU’s major business focus is the design, manufacture, and marketing of glass furniture and accessories. We use a cutting-edge digital printing technology that is durable, will not fade, and best of all, can easily be customized to match the specific needs of your designs. We use very high quality components and manufacturing processes that meet and exceed all safety and construction standards, and we do all of our own manufacturing to maintain tight control over quality. LiiU is always adding new designs and products to give you a large palette to meet the needs of your diverse clientele. At LiiU, everything we do starts with love and becomes a gift. Our vision is to make the best gifts in the world, and our mission is to bring art into everyday life.